Along with direct searches for new particles, we can indirectly detect them. To do this we need to study special processes predicted by the Standard Model that are both rare and precisely predicted. Deviations from expectations are a sign that something never before seen might be occurring. LHC data allow us to search for these rare phenomena so that we can study any deviation found, and learn something about new particles causing any anomaly observed. The decay process of B0 and Bs meson particles into two muons is one of these phenomena. It is one of the rarest processes that can be measured from LHC data. The Standard Model predicts that this process only occurs four times every 1 billion Bs decays. ATLAS has searched for this process in Run 1 data and found a signal corresponding to the Bs decay happening with a probability (branching fraction) of B(Bs to μμ) = (0.9 +1.1-0.8) x 10-9. This result is lower than, but compatible with, the Standard Model prediction at a level of about 2 sigma (standard deviations). For the corresponding B0 meson decay, the Standard Model expectation is an order of magnitude smaller (one in ten billion decays). This is at the limit of the current sensitivity of Run 1 data at ATLAS. ATLAS has not seen a signal and has extracted an upper limit on the decay probability (branching fraction) of B(B0 to μμ) < 4.2 x 10-10. These results have been reported at the Moriond winter conference and will soon be published. They are statistically compatible with the previous measurements performed by CMS and LHCb collaborations with LHC Run 1 data. 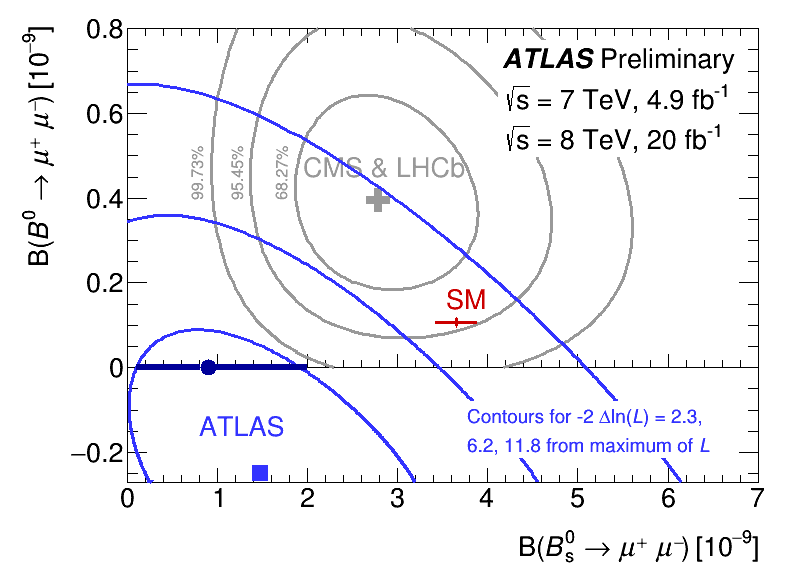 The ATLAS result on Bs decays is smaller than the Standard Model, which might point towards new physics; however, the jury is still out on this. Only more data from the LHC will allow us to understand if new physics is affecting these measurements. Moriond 2016 talk by Sandro Palestini: "Studies of the rare decays of B mesons to muon pairs with the ATLAS detector at LHC Run 1"